Instead of washing that man right out of your hair, do you ever wish you could wash that curl/wave/frizz right out of your hair instead? Fall isn't all pumpkin and cozy sweaters folks, there is rain, and GASP there is still humidity! I recently cut off over 13 inches of hair to donate to Pantene's Beautiful Lengths Program for Women With Cancer (if you missed that post, check it out HERE), and while it doing felt great, it also left me with hair way shorter than I have ever cut mine before. The shorter my hair is, the wavier it gets, which to some would be a blessing in disguise as it's naturally thin so the curls do give it body, except my hair in addition to being very thin is also super frizz prone, so while I actually do love my natural wave pattern, I do not love the frizz that comes with it. To keep the frizz monster at bay I tend to blow dry AND flat iron my hair regularly. This pattern is very much a 'catch 22'. I blow dry then flat iron to knock out the frizz and wear my hair straighter, but doing so does weaken the hair over time making it more split prone. Once you have split ends you tend to have to cut them off to get the hair back to a healthier place. I may have just found an end to the cycle! 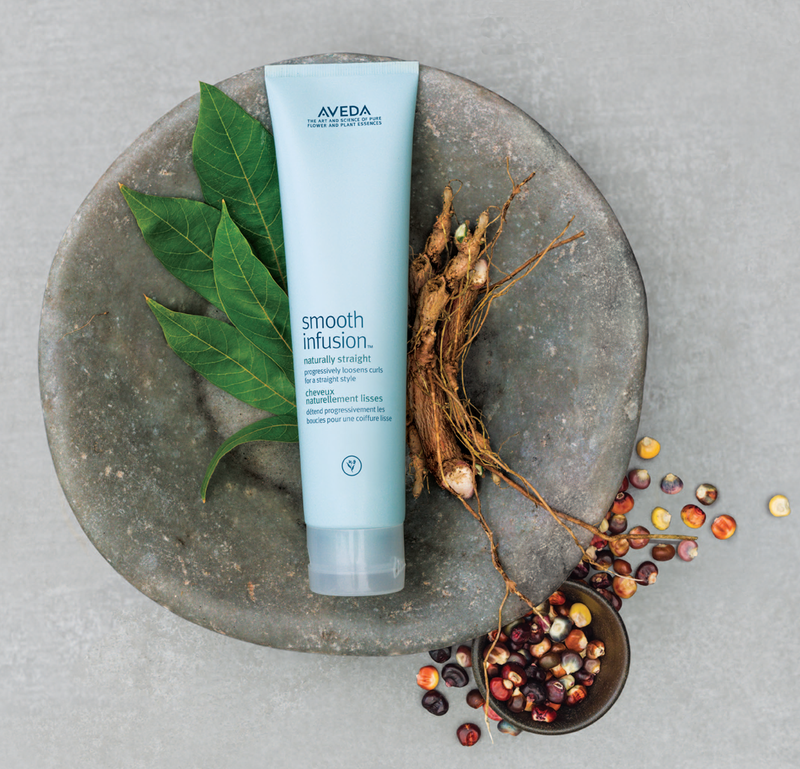 Ƹ̵̡Ӝ̵̨̄Ʒ - Step 2: Apply Aveda Smooth Infusion Style-Prep Smoother to damp hair, work it through from the mid-shaft through to your ends. Ƹ̵̡Ӝ̵̨̄Ʒ - Step 3: Apply Aveda Smooth Infusion Naturally Straight based on your hair's length and thickness, start by using a small coin size drop (think about a dime size) on towel-dried hair one section at a time. Ƹ̵̡Ӝ̵̨̄Ʒ - Step 4: Blow Dry hair straight (the larger the brush, think a large round or paddle the straigher your results will be) Flat iron if a sleeker result is desired. Watch this video which shows Aveda working directly on four hair types to show how the Smooth Infusion line works with hair that is naturally straight but frizzy, hair that is wavy, hair that is coily and they give you a tip on just how to measure your hair to determine the amount of product needed. Yes count me totally jelly that I wasn't invited to get my hair done at Aveda! 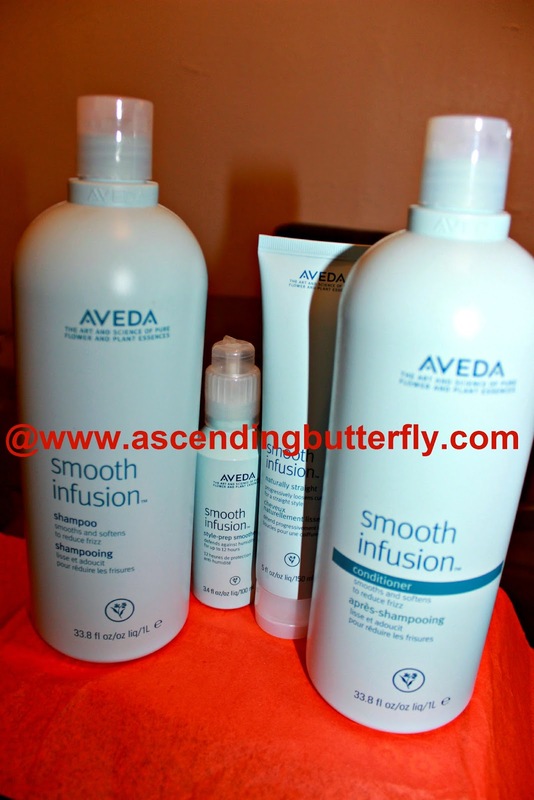 The Aveda Smooth Infusion System is working well for me, I have actually not put a flat iron to my hair since I started with this system so I'm noticing a remarkable difference with way less split ends in my hair, Blow drying it has actually been enough which for me has never happened before, since it's shorter I want motion, body and bounce, and I get just that using these products without my flat iron. I love the system as a whole, but the smooth infusion Naturally Straight was the super star of the entire line for me as it made detangling my hair a breeze and I find that the system has also cut down my time spent blow-drying my hair significantly. Anything that gets me out the door faster and keeps the frizz monster at bay is definitely aces in my book. There are literally NO cons here for me. I would actually advise you to use a bit LESS than you may think you need which is a pro in my book as the product will last longer! Now please remember you should still blow dry for a straighter finish especially the first few times you use it, but once it builds up depending on just how straight a final look you are looking to achieve you may even be able to skip blowing your hair every now and again. I found myself tugging at my hair way less to get it straight, it de-tangled my hair quickly and easily and cut my drying time, TOTAL SCORE! Have you tried Aveda before Butterflies? Which product in their line works best for YOU? FTC Disclosure: This is a sponsored post for Aveda in conjunction with SheSpeaks. As always, all opinions are 100% my own. I am disclosing this in accordance with the Federal Trade Commission 16 CFR, Part 255 - Guides Concerning the use of endorsements and testimonials in advertising, you may check our Giveaway and Disclosure Page for additional information regarding Ascending Butterfly Disclosure. I use many Aveda products. I have always been happy with the ones I've used. Very cool that you cut your hair to donate! I have yet to try Aveda products, but it's good to know that they accommodate curly, frizzy hair. I should try it out one of these days. I have tried many products but my hair has always had a mind of it's own. I've have seen the Aveda products and their posters on the train and I admit that my interest has been piqued. I always love your reviews and so I think I'll give Aveda a try thanks for the heads up . All those products look fabulous. I need the smoother. I wonder if this would work on my hair. I have a few sections of my hair that grew back curly/wavy/weird after I went through chemo. The rest of my hair is pretty straight. I'd love to find something that won't damage my hair! Plus, I LOVE the way Aveda products smell! This sounds like a good product to straighten your hair. The step by step instructions are great. I love my curly hair. It's easy and fun but the Frizz, oh the frizz! It kills me. Oh my gosh! I have totally been wishing my hair was straight instead of curly. I am definitely going to have to check these products out! I have not, and have just barely wavy hair, but I have several naturally curly haired friends who would love this! And I used to perm my hair to get it curly! We always want what the other one has! Thanks for the info Tracy! even though I have a keratin treatment, I use Smooth Infuser on the ends of my hair whenever I dry my hair. I love that it's not heavy or greasy. It keeps my hair smooth and prevents flyaways. I have naturally curly hair that I straighten, and I deal with frizz straightened or not. I'll have to check out this product! I have naturally curly hair and it frizzes. I blow dry it straight only when I have someplace to be. I have not tried Aveda hair care products. The Pantene program is awesome. I have been donating my hair there for the pat 6 years! I haven't ever tried these products, but I think I need to. My hair gets pretty frizzy in the winter, especially when I heat style it. I have tried some Aveda products, but not many. I should try some more. I already have super straight hair s I won't need that one. I love Aveda! I have actually used the smooth infusion before and it does wonders! They have a great product line! I haven't used Aveda before but I'll give it a try. My hair is naturally wavy so I have to straighten it to make it look normal. I have never used Aveda before but this sounds like exactly what I need. I use the same blow dryer, flat iron combo and it is definitely damaging my thin hair. I have this set and LOVE it. It really makes a difference. I have never used Aveda products before. These sounds great and totally worth checking out. I think it is awesome you donated so much of your hair for such a great cause. I have not tried this product yet. I am looking forward to seeing the results for myself. Agreed! I love when people donate their hair too!! Such an amazing cause, that makes a big difference to the recipient. I love Aveda! They have some amazing products! I haven't used this exact product before but it looks great! I have super straight hair but it does get frizzy! I need that smoother on before I dry it! This is, by far, one of my favorite hair care brands! I used this and I wasn't impressed at first. But being able to go a few washes with it still working changed my mind! I know people who are in the Aveda school! This seems like a great products, but I have actually learned to embrace my curls and learned to love my frizzes!